Rizzoli International Publications, 9780847837939, 688pp. Like a hall of fame for cookbooks, this is a food lover's dream collection, featuring 501 recipes from favorite authors. Any cook will tell you that in every cookbook there are a handful of recipes that rise to the top--the earmarked and most-stained pages. 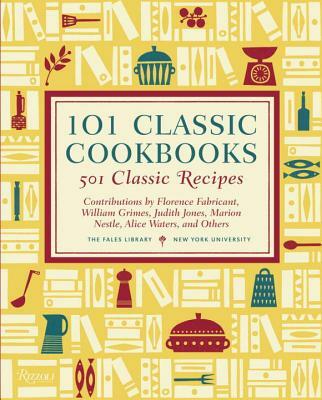 In this marvelous collection, 501 of these signature recipes have been carefully selected from 101 great cookbooks of the twentieth century--beloved tomes passed down through generations. The list of masterworks was chosen by an expert advisory committee that includes Jonathan Gold, Michael Pollan, and Ruth Reichl. It is like having a library of culinary classics condensed into one volume. You'll discover so many timeless gems, such as Julia Child's Boeuf Bourguignon, Elizabeth David's Bouillabaisse, Marcella Hazan's Bolognese Ragu, Jacques Pepin's Brioche, James Beard's Pig Hamburgers, and Irma Rombauer's Devil's Food Cake Cockaigne. But you'll also read about how these books and recipes revolutionized the way we eat. Interspersed throughout are nostalgic images from the vintage first editions. It is a fascinating culinary tour that in whole tells much of the story of American culture at large. The Fales Library at New York University holds the largest collection of cookbooks in the United States. Under the directorship of Marvin Taylor, it has amassed more than 55,000 volumes related to food. It is also home to the well-regarded lecture series Critical Topics in Food, hosted by Clark Wolf. Marion Nestle writes the -Food Matters- column for the San Francisco Chronicle and is the author of Food Politics, Safe Food, What to Eat, and Why Calories Count.